How much does it cost to buy an e-bike for commercial use? A good e-bike can start from $2,200, even though the e-bike we recommend for organisations is the eZee Sprint. The eZee Sprint is available as 2 different models, the 7L Classic and the new Alfine T4. For hiring or leasing options, find more info below. For bikes other than the eZee Sprint, we can provide a quote at the time. You will find more information on our other bikes in the section “E-bikes, features and specs”. How much does it cost to hire or lease an e-bike? eZee Sprint 7L Classic: $260.87+GST/bike. eZee Sprint Alfine T4: $330.45/bike. Hire is the most flexible option because it gives the option of returning the bikes. Or, if bikes are a success, they can be purchased at any point and we would provide a quote at that time. If you have been hiring e-bikes for 15 months, then each bike can be bought for $1. Alternatively, we can buy them back from you at a price to be determined at that point and refresh the fleet with new bikes. Is there a minimum term or minimum quantity of e-bikes? There is no minimum monthly term or bike quantities for hiring or purchasing because we want your organisation to have as much flexibility as possible. For commercial leasing, the minimum term is 12 months with no minimum quantity of e-bikes. Do e-bikes need maintenance? If so, how much should our organisation budget annually for maintenance? Yes, e-bikes need maintenance and we do it ourselves on-site. We provide first 6 months of free on-site maintenance of the bike (parts not included). eZee Sprints are robust and low maintenance kind of bikes so we usually visit every 8 weeks in most cases. For bikes heavily used on a daily basis, then maintenance should be done every 4 weeks. Sprints are also unlikely to need parts in the first 6 months. After the 6 month period, we charge $80/h + parts. A conservative estimate would be $600 per bike per year on maintenance to keep the bike riding in optimal conditions. But that figure can change depending on your organisation’s needs. What e-bikes do you recommend for commercial purposes and why? The e-bike we recommend for organisations is the eZee Sprint which is available as 2 different models, the Classic and the new T4. The Sprint Classic has been a staple of both private and public organisations for some time, while the new Sprint T4 has some significant refinements which make it more user-friendly and even lower maintenance. User-friendly low step-through frame and adjustable seat & handlebars: bike can be shared and ridden comfortably by short and tall people. Easy mount and dismount. Upright riding: more comfortable, no hunched over the handlebars. Safer with better visibility for you and drivers. Mudguards and chainguard: your work clothes will always be clean. Sturdy rear rack: attach panniers to keep your stuff dry and secure. No sweaty backs carrying a backpack. Integrated rear wheel lock: a lock bolted to the rear part of the frame. It takes a second to operate and immobilises the rear wheel. Very practical for those situations where you need to pop into a shop and there’s no bike parking close by. Additionally, a high security chain can be plugged into the rear wheel lock which means that with 1 key you have 2 locks. Integrated super bright front and rear light. No need to be charging lights. Front one can light up the road at night or a dark car park, especially useful for people that need to ride early in the morning or late in the afternoon. Rear light can be easily seen from a distance providing extra safety. Internal gears: gears inside the rear wheel hub are the best for city bikes. Intuitive to use, super low maintenance, and can shift without pedalling. Puncture resistant tyres: the legendary Schwalbe Marathon Plus with the highest level of puncture resistance there is. The kind of tyre that can be ridden for more than 10,000km and can sustain the high speeds and loads of e-bikes. We don’t equip bikes with airless tyres because they create more issues than what they solve. Throttle and pedal assistance systems: throttle is particularly useful for taking off, especially when the bike is loaded. It also helps when the rider wants to take off ahead of traffic, increasing their visibility. It can give a boost of power to go over a hill or overtake slower cyclists. Powerful high torque motor: the bike will get you and your cargo over any hill without breaking a sweat. Dual-legged kickstand: even with heavy loads, the bike stands upright when parked. Long range batteries: easily ride 50km on a full charge of the standard battery, given an average level of assistance and some pedalling. For long distances, batteries can be upgraded to 80km or 120km. Batteries mounted centrally and low: the battery behind the seatpost has many benefits: weight is central and low helping with stability, stretches the wheelbase which also adds stability, it doesn’t interfere with the rear rack cargo capacity, and it out of way when mounting or dismounting the bike. How is the Sprint T4 better than the Sprint 7L Classic? Smoother pedal assistance system. Sprint T4 has a torque sensor to give variable levels of assistance depending on how hard the rider pedals. The Classic Sprint uses a simple, reliable cadence sensor to detect that the rider is pedalling and switch the electric motor on. Both models also have a throttle. More powerful brakes. The Sprint T4 has Shimano hydraulic disc brakes front and rear. The Classic Sprint has a powerful Shimano hydraulic brake on the front, and a low maintenance Shimano roller brake on the rear. Nicer gears. T4 has the top of the line Shimano Alfine 8-speed hub and uses a chain tensioner for even lower maintenance. The Classic Sprint has a 7-speed Nexus geared hub. What if we want other bike than the eZee Sprint? 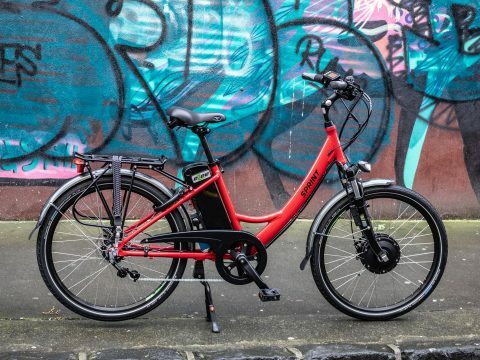 We have a the biggest selection of e-bikes in Auckland (and probably New Zealand) so we are always happy to talk you through other options than an eZee Sprint. We are a certified Bosch centre so we stock bikes equipped with Bosch mid-drive motors, as well as folding and cargo bikes. Generally speaking, you can expect these alternatives to be more expensive and with higher maintenance costs but with more refined technology and provide more alternatives. As an example, folding e-bikes can be used in conjunction with driving and public transport. Cargo bikes can carry a really big load such as tools or products. What accessories are needed to ride the bike? Helmets and locks are a must. Good quality and comfortable helmets start at $59 each. You can equip the bikes with a high security chain lock (RRP $70) that connects to the in-built rear wheel lock. Or pricier D-locks for the ultimate level of security. Pannier bags go for $80 or more. And for an extra $40, you can also add a phone mount for navigation. Some other accessories you might want to consider are front or rear baskets, rain ponchos, and hi-viz vests or jackets. How far can I go on a full battery? A fully charged standard battery can easily do 50km on average, given a medium level of assistance and some pedalling. If the rider didn’t pedal at all and used only the throttle, then the battery would last 25 to 30km. That range is more than enough for most work-related trips but if people need to go even further, then we can upgrade to batteries that can do 80km or 120km. How do you charge the battery? Charging the e-bikes is as easy as charging your mobile phone. Bikes come with a charger that plugs to any power point and to the bike’s battery. Simple as that. If there are no power points where the bikes are parked, then you need remove the battery and take it near a power point. A flat battery usually takes 5 hours to be fully charged but people rarely use their batteries completely. Even though is not essential, we recommend installing timers on the power points such as these: http://intelliswitch.co.nz/. Keeping a full battery charging for long is not great for the health of the battery and could be a potential fire hazard so a timer is a good investment. Do batteries have a “memory effect” and lose capacity if they are charged when they are not completely empty? There is no “memory effect”. Modern batteries use the same kind of technology as your mobile phone batteries so they can be charged at any point. How many years of use should be expected from a battery? Good quality batteries like the ones on eZee bikes (made by the likes of Panasonic and Sanyo) are rated for 1000 cycles which means that after 1,000 full charge and discharge, it should retain 75% of its original capacity. People usually replace a perfectly working battery after 4 to 5 years just because they want to have the longest possible range. Also, as battery technology improves, people want to upgrade to batteries with longer range or smaller size. How much does it cost to replace a battery? A standard battery (i.e. 19Ah/680Wh for an eZee Sprint) is around $1,000 while some Bosch batteries tend to be more expensive, around $1,200. But these prices can change in the future. What is the warranty on e-bikes and batteries? eZee bikes carry 2 year warranty on everything including spokes, something that most brands don’t offer warranty on, and 10 years warranty on frames. All of our other bikes carry 2-year warranties. Do you provide insurance for the e-bikes? Yes, we do. But insurance companies don’t have specific products for bikes or e-bikes so we use a form of self insurance that adds a certain amount per month to the hiring fee. In the rare case an e-bike is stolen and you haven’t got it insured, then you will need to pay for the bike. If you purchase the bikes, many insurance companies allow bikes to be included in the contents insurance. But please double check your policy and aim for one that offers replacement value, not market value. How do you park the bikes securely? If you want to park an e-bike when you are out and about, we recommend you use the combination of chain lock and rear wheel lock. This is what most people prefer given it is practical and quick while still being a high security measure. But if you need the ultimate in security, you can add a super strong D-lock. For parking and locking the bikes at the organisation’s premises, we have joined efforts with www.bikeparkingnz.co.nz, the leading supplier of commercial bike parking equipment and shelters to the New Zealand market. They are an operating division of CAM Shelters which has been operating in NZ for over 15 years. We do not charge for this service but we work with them to design the best solution for your organisation. This can be from bike racks or rails bolted to the ground or walls to cages and shelters. Can the battery be stolen? Yes, it can. That’s why every e-bike battery is lockable. The battery is the most expensive single item on an electric bike and the cells (the inside of the battery) can be used in many applications, which makes them a desirable item for thieves. On eZee bikes, the rear wheel lock key is connected to the battery key which means that every time you lock the bike, you are forced to lock the battery as well. What should I do if the bike breaks down or has a puncture while using it? For members of the AA, you can use their AA Roadservice and they will assist you if you have a breakdown but they don’t assist you up if you have a flat battery. Depending on your membership, they can even take you home. Find more info here: https://www.aa.co.nz/membership/ebikes/. Terms and conditions apply. Alternatively, depending on where you are we can go and meet you and try to fix the bike. Our details are on the stickers on the bike so you just need to call us and, if possible, we will go and help you out. This service has a cost though that you will need to agree to. Fortunately, it has never happened. Otherwise, you can lock your bike in a safe place and we will collect it and fix it. We’re working on a key management system so we can have a copy of each key of your bikes. 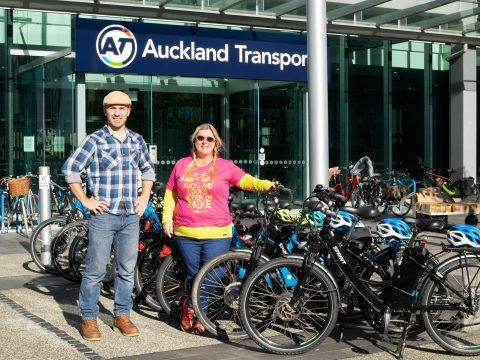 We have teamed with Megan Page, aka ElectricMeg (https://electricmeg.co.nz/) who is one of the best e-bike coaches in the NZ. She specialises in enablement for cycling in the workplace – especially ebikes – including health and safety advisory, training and assessment. If you think that the people in your organisation don’t need training or health and safety advice, we can walk you through the functioning of the e-bike, advice for locking and riding. This is the same kind of service we provide to every customer. Do you provide advice on how to get around Auckland or an e-bike or maps? Yes, we do. Auckland Transport provides provide maps of almost every cycleway in Auckland and we have them in stock. You can get them for free from Auckland Transport website. But we also know that sometimes those maps are not enough for your organisation needs. People might need to go to places with no cycleways or cycling infrastructure. If that’s the case, we are happy to “design” routes for your staff, get them printed or uploaded to an app so people can navigate using them. We ride our bikes everyday and everywhere around Auckland so we know the best, safest, and nicest ways to get to places avoiding busy and fast roads. Riding through suburbs, parks, etc can be as nice and safe as riding on protected cycleways since there tends to be little traffic and it usually goes at low speeds. 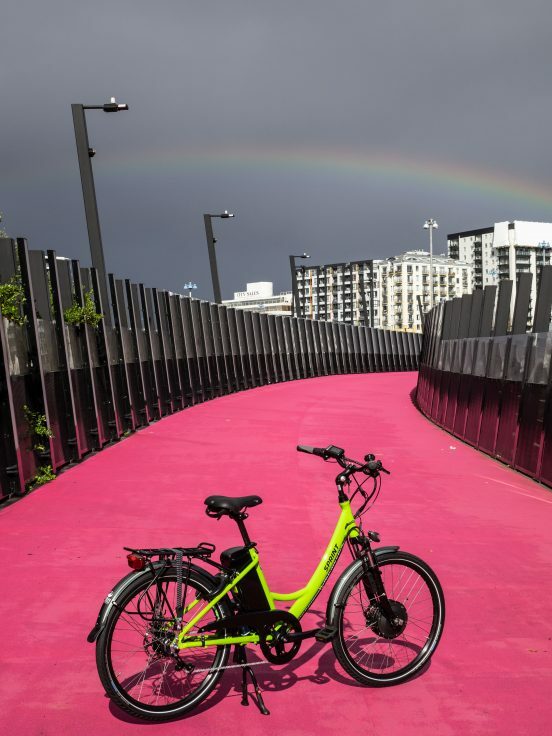 Most people in Auckland are used to driving everyday and use main direct roads and highways which means than when they transition to an e-bike, they tend to pick the same routes. This is exactly is the opposite of what they should do. Riding a bike with electric assistance means that people don’t need to pick the most direct or flattest route but they can have the luxury of picking the most pleasant one even if it is less direct, hillier or windier. • Social Ride Saturday Sep 1, R&M visits Auckland and more from our latest newsletter! • Hub motors and mid-drive motors on electric bicycles – What’s that all about?